Nicole writes: I just got a new MacBook Air and really like it; however, the Macintosh HD icon is missing from the desktop. How do I set that up? Hi Nicole! Congrats on the new Mac, but yes, I can see how it might be a bit odd that there’s no hard drive icon sitting on your desktop. 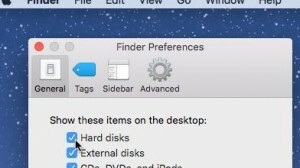 Now, one way to deal with a missing Macintosh HD icon is to simply select New Finder Window from the Finder’s File menu at the top of the screen; doing so will open a new window that’ll allow you to dig into any volume accessible from your Mac, including your hard drive. No “Macintosh HD” icon on your Mac desktop? Make sure the “Hard disks” box is checked in the Finder Preferences window. That said, I totally get why you’d want the missing Macintosh HD icon back on your desktop. Here’s how to do it. Click the Finder’s File menu at the top of the screen (just click the bare desktop if you don’t see the word “Finder” next to the Apple menu), then select Finder Preferences and click the General tab. Now, go back and check your desktop. You should see the missing Macintosh HD icon sitting right there, right where it should be. Hope that helps, Nicole. Still have questions? Let me know! Click the Sidebar tab in the Finder Preferences window to pick and choose which items appear in the sidebar of any Finder window. Among the choices: “All My Files,” Applications, your hard drives, and Downloads. Mac tip: What’s this icon on my desktop, and how can I hide it?